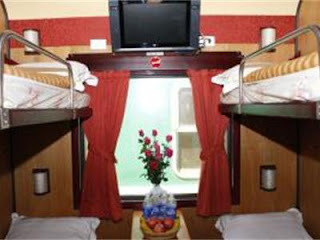 Royal Express Train is another top deluxe transportation service on the railway from Hanoi to Sapa. This train has 2 carriages, which includes 7 cabins with 28 berths. It is attracted by offering soft sleeper carriage, A/C clean four-berth cabins. In particularly, the cabin attendants will further comfort the trip with their enthusiasm, hospitality and helpfulness. In spite of providing such a perfect train service to passengers with top deluxe advantage, the ticket fare to get on those carriages is quite reasonable. All carriages, which are wood-paneled inside and decorated with noble wood furniture, include individual reading lights, baggage storage, hygiene pillow and blanket, bottled water, fresh wipes, toothpaste and toothbrushes. It generates an atmosphere of coziness, glamour and high class to the customers. In addition, there is no dining and bar carriage for demand of the passengers. However, price is the most effective competing aspect of this train service.